Please bear in mind that the CC lincence refers only to my photographic artistry, and not to the design of this product which remains the copyright of iRiver. I finally splashed out on an Mp3 player, and I am pleased with my purchase. 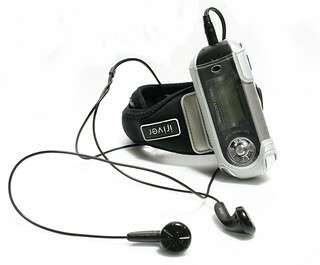 It has been a few years since I noticed the arrival of MP3 players made by then unkowns such as Rio and iRiver. Music players with flash memory and no moving parts had been predicted since as long as I can remember, so they came as no surprise, but at first I could not see the point. The memory was small, it was irreplacable, and I did not know how to get MP3 files. The player above comes with software for converting CD music to Mp3 and has 1GB of memory which is enough for 200 songs or about 12 hours of music. It also has a voice recorder which I hope to use for recording English speakers for use as teaching materials. The reason why I purchased this particular player, at auction for about $150 USD, is because these older iRiver players accept an external microphone, which is pretty essential for recording dialogues. The reason why I am recommending it here is because this player, weighing only 60gms including battery, with no moving parts, and an armband, can be worn while jogging. Messengers, "That's the Way a Woman is"
The Cure, "Close to Me"
The Zombies, "Time of the Season"
The effect, the buzz, the improvement in jogging speed is phenominal. it is almost frightening. Now I know why Lance Amstrong has an Mp3 player built into his sunglasses. This image was taken by me but is of a device copyright of iRiver. I hope they forgive my posting it here.